How could I not paint Tom’s veggies? I am lucky! I am married to organic farmer,Tom Shepherd and I get to eat his wonderful produce on a daily basis! So why stick to just painting birds and landscapes? Why not paint Tom’s veggies and fruit? 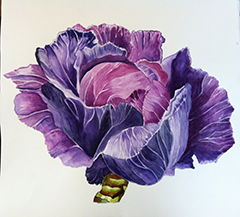 Here is a painting of one of his purple cabbages. You can’t eat it but you can buy it at Plum Goods in Santa Barbara. Just a reminder, try to eat healthy during this season of goodies everywhere that you turn. I am also reminded of how fortunate I am to live where I do and eat what I eat. I have fed the homeless for over 25 years both here and when I lived in Chicago. I say this not because I’m trying to show what a great person I am, rather I share this because it is such a wonderful thing to do for the giver. It feels so great to share and I hope that anyone who might be reading this will try it.